Initially I was worried that Lush Enzymion Facial Moisturiser would strip my skin of oil which works for a day or so until my oily skin panics and produces more oil to compensate for the dehydration. My reasoning for such thought is that Lush Enzymion claims to keep oil at bay and has been angled for wear under make-up. Rest assure that it does indeed hold up well under make-up, can help control excess oil and is not stripping in the slightest. 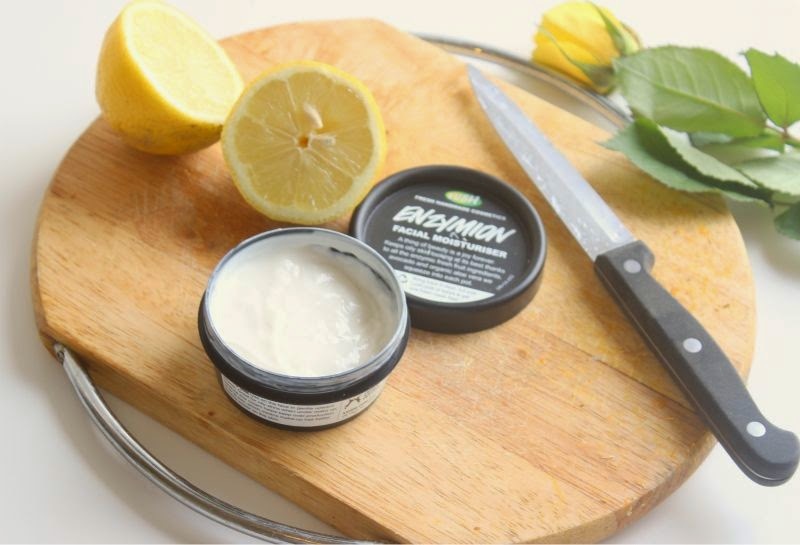 This is because Lush Enzymion Facial Moisturiser contains carefully selected ingredients such as papaya(naturally brightens) and lemon (for oil control but also is a natural antiseptic) which contain natural enzymes which gently exfoliate the skin with each use. The idea is that the Lemon will help de-congest and to a degree cleanse the skin (crazy huh) while the Papaya gently renews the skin with each use. Arguably alone this could be stripping so to ensure the skin gets a much needed does of hydration (which won't overwhelm oily skin types) both Cocoa Butter and Avocado Oil have been added to the blend. I may be speaking for myself but having oily skin I find I am prone to blemishes? To soothe and speed up the healing process have added Aloe Vera which cools and calms the skin as well as generally being refreshing. 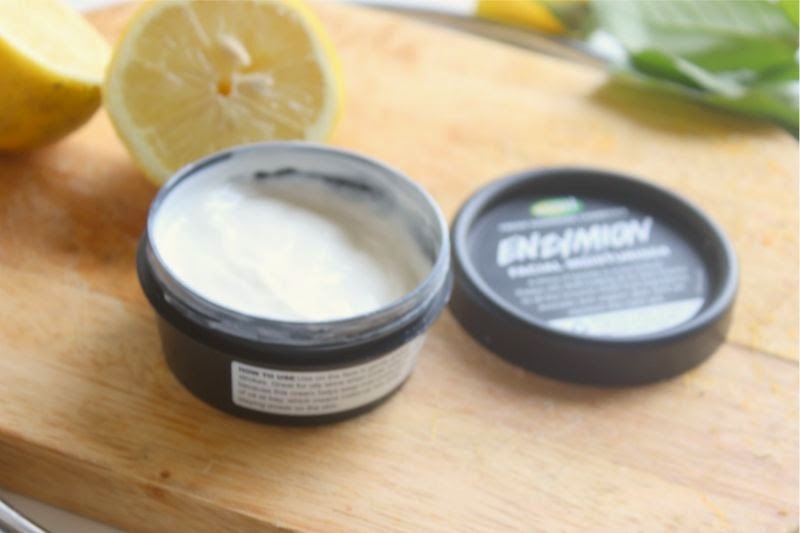 Ingredients are all fine and dandy but does Lush Enzymion Facial Moisturiser work? In a word yes, I have been using this solely for two weeks and find that my skin is much more balanced. My complexion is brighter, soft to the touch and less prone to being excessively oily. I won't pretend for one moment my skin is out of the oily category because let's be honest you can't really fight genetics but this has certainly helped. In terms of hydration I don't think this would quench really dry skin but for most oily to normal complexions it is a light, refreshing treat for day wear, I'd use something a little more intense come night fall. I should really mention it smells wonderful - zingy, citrus fresh thanks to the addition of Lemon and Papaya. As Lush state this is a great moisturiser to apply underneath make-up because it is light, refreshing, won't compromise any product layered on top and absorbs instantly. The texture of Enzymion is light and more akin to a lotion than a cream which of course is perfect for oily skin types. If you have oily skin you really must try this out - even if you don't and want a brightening yet gentle moisturiser this is the one to grab. 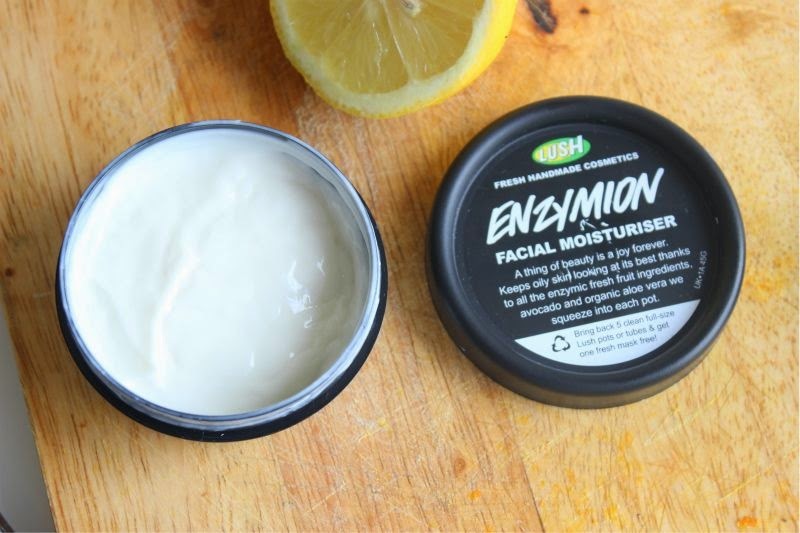 Lush Enzymion Facial Moisturiser £13.95/45g via Lush - link. It's like Lush knows what my skin needs. I need to pop this in my wishlist basket, because I have a typical combo skin type. 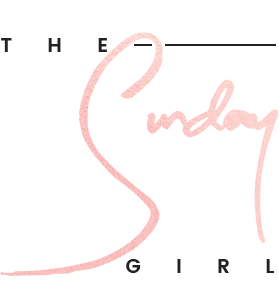 Such a great post, I am currently trying out this moisturizer too. 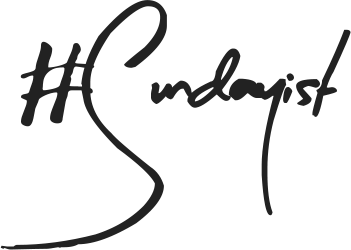 I just discovered your blog and I'm really enjoying it, thanks!